The Duke was very popular with his troops, very like the Grand old Duke of York who had 10,000 men!!! 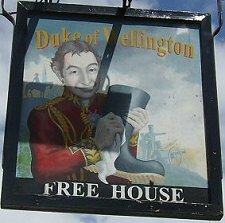 This sign shows that the Duke was not two faced. He was a genuine man, he called a spade an impliment for digging holes. The sign also shows his private army the 423rd and 5/8ths Muddlecombe Fusiliers, who were formed in 1301. They were famous for inventing the field gun years before gunpowder was introduced to Europe from China. So for many years they used it as a battering ram. That is why field guns have a bellied end to their barrel. The sign also shows the cat that used to be fired from the regiment's catapult. The cat would when in full flight as it was catapulted over Hadrian's wall. This forced the Scots to invent the Bagpipes in retaliation. The cat was last used for purposes other than being the family pet to carry the terms of The Fair Rent Act in 1832. The rent for a room determined by whether there was room to swing a cat by its tail. If the cat hit the walls then the rent worked out cheaper. The Muddlecombe Fusiliers never got lost in battle because they always took a road sign with them pointing the 7 1/2 miles home to their village. It was due to their initiative that in 1874 the War Office renamed their regiment "The Army Intelligence Division". For more details visit the 423rd and 5/8ths museum at the Duck & Glue Pot public house in the High Street, Muddlecombe. 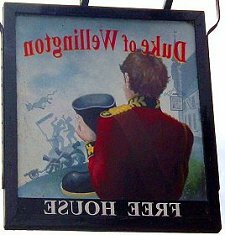 This sign depicts The Duke of Wellington returning to Wareham for Christmas 1815, after the Battle of Waterloo. It shows him polishing his boots prior to removing his sock so that he could hang it up for Santa.